I regularly get emailed questions about me, my blog, and my business, so thought that I would put together a little FAQ page to cover some of the most common questions. I will keep it updated as much as possible, but if you can't see the answer to a question here then please feel free to email me! where did the name Ladybird Likes come from? when I was younger I was given the nickname ladybird by some elderly relative - I'm not sure why, but we had a bush in our front garden that always had ladybirds on it, and I have so many happy memories of letting them walk over my arms and watching them fly away. 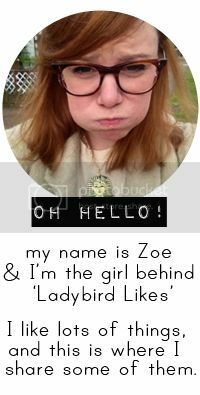 I wanted this blog to be a place to share all the things I like, so Ladybird Likes was born. I started blogging somewhat sporadically in 2010, but really got focused on updating my blog in 2011. Now I don't know what I did before I had a blog! In 2009 I had a messy break-up from the boyfriend I'd been with for 5 years. I'd just finished my degree and was feeling a bit lost, and lonely, and didn't know what to do with myself. I started reading blogs online and made a few friends who encouraged me to start a blog of my own. It sounds silly but blogging gave me a purpose - on days when I would have sat at home watching movies in my pyjamas I got up and went out to take photos for my blog. what cameras do you use for your photography? I have many cameras (some may say too many!) but the main ones I use are my Canon 400D (a digital SLR) with either the 18-55mm kit lens it came with, or a 50mm prime lens (which I cannot recommend enough - it's such a great lens and you can get one for under £100), my Canon AV-1 which is a 35mm aperture priority camera (meaning you can change the aperture and it sets the shutter speed automatically to acheive the correct exposure - in the same range there is also the Canon A-1 which is fully manual), and my iphone camera. I also own numerous toy cameras, which I will be blogging more about soon. I am by no means a photography expert, but I will be compiling a series of blog posts in the near future with some tips for taking photos which I hope will be useful! In the meantime if you have any specific photography questions please feel free to email me and I will do my best to help you. did you study art at university? The short answer is no, I didn't. The long answer is this; I actually studied Creative Writing for my BA (at London Metropolitan University if you're interested!) but when I left sixth form I went to Northampton University and studied Psychology and Criminal Justice Studies for a year. I wanted to be a behavioural analyst (yes, I'm obsessed with Criminal Minds!) and while I loved studying psychology and criminal behaviour, and am still endlessly fascinated by the human mind, I am not academically minded in the traditional sense. I do not test well at all, and found the workload overwhelming. So I dropped out, and moved home to London feeling like a failure. I still wanted to do a degree in something, and decided to just go for something I loved and was moderately good at in school, hence the Creative Writing. There were no tests, rather you were graded on essays and written pieces. I ended up graduating with a First Class Honours. Since then I have taken a one year diploma in Photography, as well as short diploma courses in Creative Thinking, Beginner's Japanese, and Photojournalism. While there are times I wish I had done a degree in Art and Design, I don't regret the path I chose at all. I think no matter what your background is, if you're creative you will find a way to incorporate it into your life. can I use your photos/blog content on my blog? Yes, of course! All I ask is that you always link back to my blog (or to my Etsy shop if you're featuring something I've made) and if possible please message me to say you've featured me, as I'd love to see it! Also, please don't add my photos to weheartit as the original source is almost impossible to find. are you interested in collaborating with other bloggers/crafter/photographers? Yes, definitely! I love collaborating with other creatives so if you'd like to work together on something, or even if you'd just like to do a feature with me on your blog, then please get in touch. I'm really open to everything, so even if you don't think it's necessarily my 'thing' please just email. In the past I've worked with others on photoshoots, on blog features, on film swaps, and am currently working on a collaborative zine. would you like to do an etsy swap? I love doing Etsy swaps, and have done several in the past :) While I cannot do Etsy swaps with everyone please feel free to ask but don't be offended if I decline. do you have any tips for someone starting their own handmade business? I get asked this question a lot, so I've decided to put together a series of posts about starting and running your own handmade business - I'm by no means an expert as my own business is still very new and small, but I've already learnt so much, and I hope that I can share some of this with you. I will update this page when the posts are up. where do you find all the amazing vintage things in your room? I've been going to car boot sales religiously since I was about 15, so it's taken me a while to collect all the things you see in photos of my bedroom and craft room. Most things are from car boot sales - my favourite one is Denham, which is one of the biggest in the UK and is only about a 15 minute drive from my house. I also love finding new car boot sales in small countryside areas, as they tend to have the best stalls with really cheap old stuff! I've only just started getting into charity shops, which I think is partly as the ones in London are pretty naff - not great stuff but at extortionate prices! I think you have to go thrifting regularly to find good stuff, and trawl through lots of rubbish in order to find anything worthwhile, but surely that's all part of the fun?! I use Photoshop CS5 to edit my digital photos, but almost all of my film photos are straight out of camera, though occasionally I will crop them, or adjust the colour balance slightly. I'm a big fan of using actions on my photos, as they save a LOT of time, and you can still adjust the layers to suit your tastes. You can find tons of free ones by googling 'free photoshop actions' but be warned, there are lots of really gorgeous actions out there, but just as many heinous ones! where do you get the graphics and fonts you use in some of your posts? pretty much all of my graphics come from either Pugly Pixel or Fuzzimo - both are great resources and loads of the stuff is free, or can be downloaded for a very small fee. My fonts are all free too, and come mainly from dafont, font squirrel, or my fonts.